What started off at the Arbory ended up being way too overcrowded for a catchup and thus the Bluetrain became the next best choice. Nestled on the banks of the yarra, this amazing restaurant resides in the Southbank complex. If you can, ensure you get a window seat, because you won’t regret the views. And once you are done looking out, you can then enjoy the view on the inside. I am partial to those light bulbs that show their filament on the inside. And no, I have no idea why I did not take any of those shots. I guess both the company and the views were too engrossing to really think about anything else. 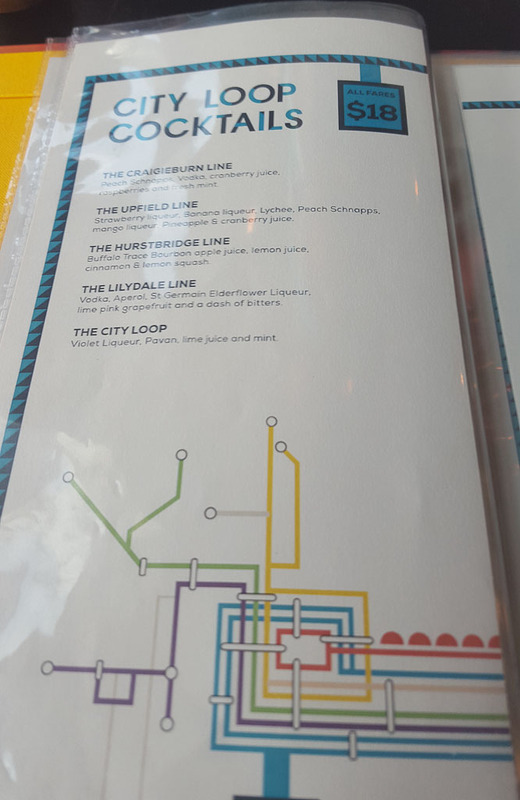 Whilst I don’t normally get something from the bar, I was partial to their “City Loop Cocktails”. I know right? With such a snazzy name, you couldn’t go wrong. I chose the Lilydale line as it’s the closest to the line I normally live on. 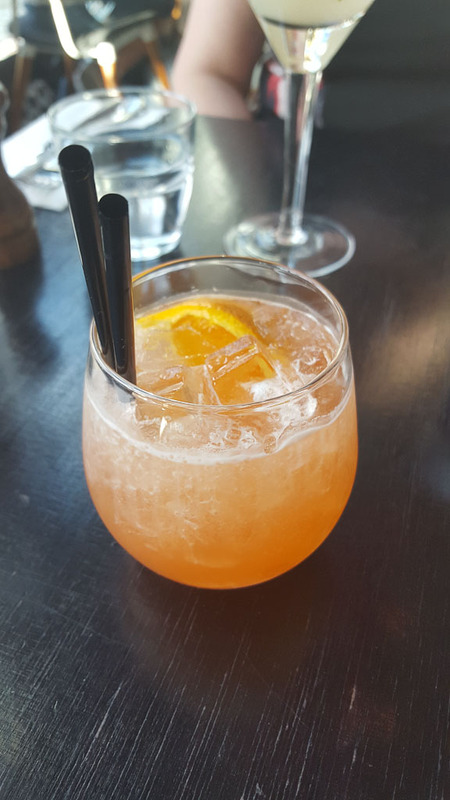 It contained ‘Vodka, Aperol, St. Germain Elderflower Liquer, lime pink grapefruit and a dash of bitters’. Guess, it was a lemon lime bitters after all… And the taste? Wow. Just wow. Every single drop was delicious as the mixture of flavours were quite impressive. The fresh ingredients made for a great crisp change from the usual fare and the juxtaposition of sweet and bitter with the citrus tang ensured that it was like having a classy cocktail party in your mouth. Given all the rave reviews about pork belly, I decided that this would be a good time to put these guys to the test. And they definitely didn’t dissapoint. 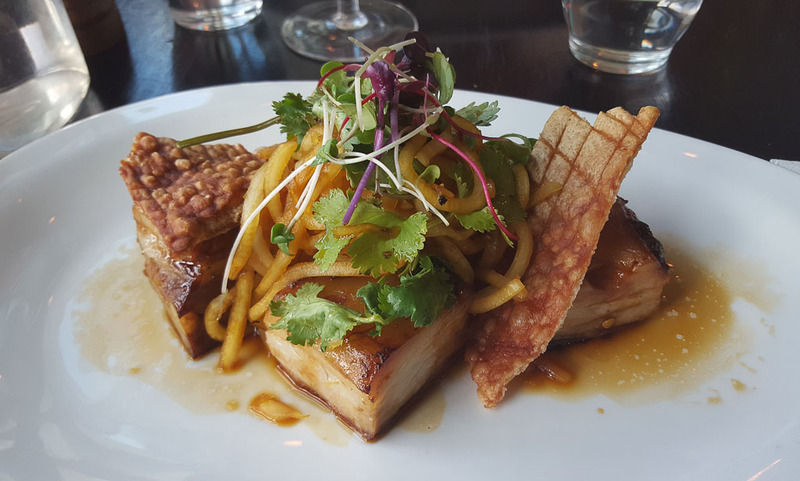 The pork belly was succulent. Cooked to perfection, the meat was soft and infused with honey soy flavouring. 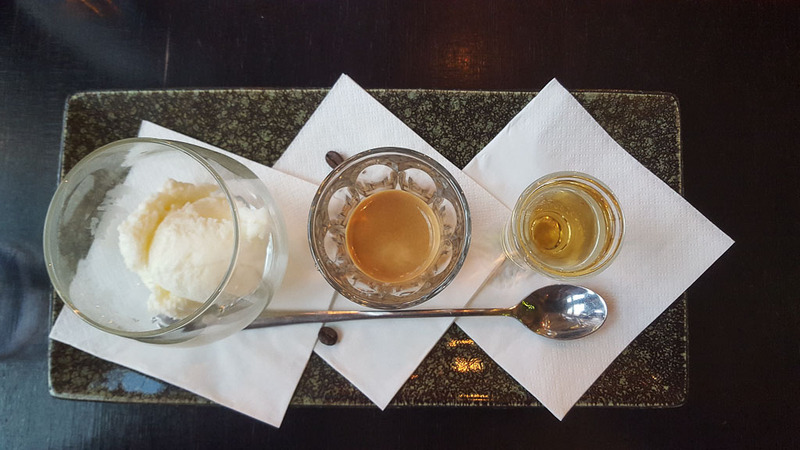 And the fresh mint used on the this, made the honey soy stick to your palette even more. 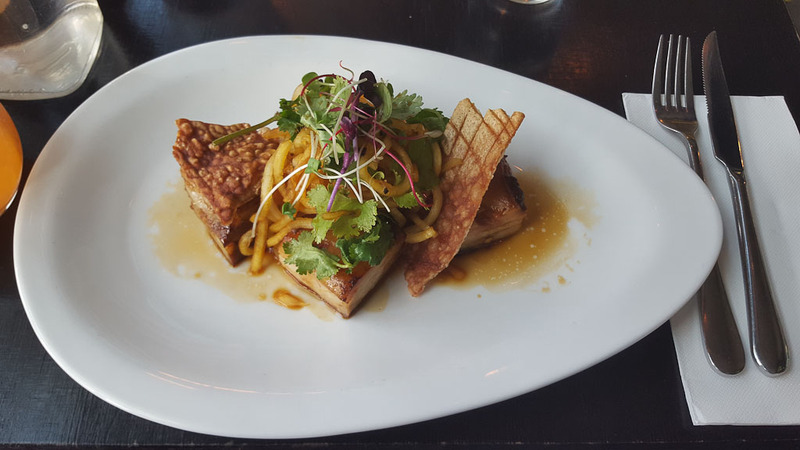 The crisp pork belly shards, did, in essence live up to it’s name. They were like glass. Plexi glass – that crumbled upon impact into uneven pieces. So if you aren’t careful, you were in for a delightful (yes, that’s sarcasm) poke. I was honestly grateful that I decided to chew through it. Even my company had to stop talking because the crunching was that loud. Heck, even the elderly couple next to us stopped to question what that noise was. I was glad once those shards were done with. The soft noodles on top were delightful and exactly what was needed to offset the shard. Once dinner was done, we decided to be a little more adventurous and attempt the dessert menu. What was quite interesting was that none of the usual items were on sale. I guess when you are unique, you are able to create your own unique brand and can’t easily be compared. And for that I applaud them. We settled on affogato with chambord. And it went down well. Definitely a place you want to go to for a dinig experience. For 2 people, it’s closing in on the “Here, have my first born”.